Elizabeth Warren is no moderate. But Bernie Sanders would be the most progressive president in US history — and he'd have a movement to back him up. Both are critics of the Democratic establishment. Both are foes of Wall Street. And both are substantive, policy-focused politicians. But that doesn’t mean Bernie Sanders and Elizabeth Warren share the same worldview. Sanders tends to focus on “post-distribution” remedies, meaning he prefers to use the government’s power to tax and spend to directly meet Americans’ needs — or replace the market altogether. His social-democratic ideas, like free college and single-payer health care, are now policies most Democrats have to tip their hat to at least for electoral reasons. Warren wants to empower regulators and rejigger markets to shape “pre-distribution” income, before taxes. Less likely to push for big-ticket programs, she wants to re-regulate Wall Street and make life easier for consumers. Before I go any further, I should lay my cards on the table. I have a conflict of interest — towards Warren. In 2012, I worked for the Progressive Change Campaign Committee (PCCC), the most influential outside PAC supporting Warren. I raised thousands of dollars for her and recruited dozens of volunteers. I spent hundreds of hours helping elect Warren to the Senate. I have written favorably about most of her Senate career since. Yet Sanders has always existed outside the traditional party system. He has more in common with non-American socialists like Evo Morales and Jeremy Corbyn than party figures like John Kennedy, to whom Warren has subtly linked herself. He would be the most progressive president the United States has ever seen. The two senators also have distinct theories of change. Sanders has long believed in bottom-up, movement-based politics. Since his days as mayor of Burlington, Vermont, he has tried to energize citizens to take part in government. He generally distrusts elites and decision-making that does not include the public. Warren, on the other hand, generally accepts political reality and works to push elite decision-makers towards her point of view. When I worked at PCCC, I was once told that Warren decided to run for the Senate after witnessing the amount of power she had as an oversight chair for the bank bailouts. She believed that “being in the room” with decision-makers in the Obama administration was essential to creating change. While Warren wants to be at the table with elites, arguing for progressive policies, Sanders wants to open the doors and let the public make the policy. Many observers point out that Warren has sponsored much of Sanders’s legislation over the past few years. But that doesn’t mean she shares his precise priorities or worldview anymore than former Big Tobacco lawyer Kirsten Gillibrand or school privatization fan Cory Booker share Sanders’s priorities and worldview because they, too, have sponsored much of his legislation ahead of their likely presidential bids. That is not to say Warren is in the same political lane as Booker or Gillibrand — she is significantly to their left. But coming around to Sanders-style ideas in the run-up to a presidential run does not equate to meaning she necessarily would prioritize them as president. Any president has a limited amount of political capital and limited congressional support, and therefore has to pick their battles. Those battles can be very expensive — the health insurance industry spent over a hundred million dollars fighting the Affordable Care Act, a law that left the industry mostly intact. One can easily imagine health care firms spending a billion dollars to stop Medicare for All, which would wipe it out. What the next president chooses to pursue in the face of political reality is heavily dependent on their core worldview and values. And if you roll back the clock a few years before Warren was considering running for president, you can clearly see that she prioritizes her pre-distribution, regulatory approach over Sanders’s social-democratic one. For instance, when she initially ran for Senate in 2012, Warren did not support single-payer health care. That position was taken by Marisa DeFranco, an immigration lawyer who ran to Warren’s left on both health care and foreign policy but who was muscled out of the Democratic primary during the convention process (one Democratic activist said it would take a “dictatorship, not democracy” to defeat incumbent Republican senator Scott Brown). With DeFranco eliminated from the primary ballot, Warren felt no pressure to shift left. During an interview with the local press, she was asked about once praising single-payer health care in a book chapter she co-authored with Deborah Thorne. “If you were the tsarina, something like single-payer, government-run health care, far lower administrative costs, that sort of thing, would be the Senator Warren prescription, would it not?” the host asked. “I think right now what we have to do — I’m serious about this — I think you’ve got to stay with what’s possible. And I think what we’re doing — and look at the dust-up around this — we really need to consolidate our gains around what we’ve got around the table,” Warren said. The host followed up by asking if Warren personally supports single-payer. “No,” she replied. Five years later — after decades of advocacy by Sanders had helped popularize Medicare for All — Warren decided to endorse the policy. But unlike consumer protections or financial regulation, establishing a single-payer health care system doesn’t seem to be a top priority for Warren. She probably isn’t opposed to doing so, but if she’s going to spend her finite political capital moving things through Congress, it’s a good bet she would likely focus on the core priorities she has championed throughout her adult life. It’s hardly a surprise that Warren didn’t raise single-payer during her first two campaign events in Iowa and when asked about it by a Washington Post reporter, suggested she didn’t bring it up because no one else at the events raised it. Warren’s marquee legislation is substantive and serious. Her Accountable Capitalism Act would increase corporate accountability to stakeholders like the workers who produce their profits. The Consumer Financial Protection Bureau, largely the product of Warren’s advocacy, has aided consumers who are ripped off by industry. But it also points to their political differences. While Sanders was authoring a bill to make health care basically free, she was authoring one to tighten regulation of the private health insurance industry. While Sanders was proposing making every public college in America tuition-free, Warren was promoting a third way approach: increasing public aid to colleges (allowing them to offer a “debt-free option”) and increasing accountability over federal dollars. “Democrats talk about resources, pointing out that we’re no longer investing in our kids the way we once did. Republicans talk about risk and incentives — arguing that students take on debt without fully understanding the consequences, and that colleges get access to federal dollars pretty much no matter the quality or cost of the education they provide,” she noted during a 2015 speech to the American Federation of Teachers. “Here’s the truth — both sides are right.” The idea of simply making public college free, as it once was in many states across America, did not occur to Warren until she endorsed the Sanders legislation to do so in 2017. Warren isn’t totally opposed to more robust government programs. She is a fan of postal banking, and she has also proposed getting the federal government into the business of producing generic pharmaceutical drugs. But both of these measures are intended to spur competition — unlike, say, single payer, which would replace most of the private health insurance industry altogether. Sanders isn’t opposed to “pre-distribution” measures. His campaign against Amazon led the company to raise its minimum wage to $15 an hour. He has authored legislation that would foster worker-owned businesses. He’s a strident supporter of unions and staunch opponent of deregulation. But it’s clear what his priorities are. All of his signal legislation is based around increasing taxes and directly paying for Americans’ medical and education costs. To him, the problem is not so much that the rules are rigged so people can’t become entrepreneurs, or that regulators need to be empowered to act on behalf of the public. The problem is that the government is not doing enough to bypass the private sector to directly deliver funds and services to the poor and working class. During Sanders’s presidential bid, he proposed paying for his agenda with a barrage of taxes and new tax brackets; in an interview last year, Warren refused to say what she thinks the highest tax rate should be, although in the past she has endorsed a fairly conventional Democratic policies on taxes, such as the “Buffet Rule.” Sanders famously told the same interviewer who queried Warren that he didn’t mind the 90 percent marginal income tax rate under President Eisenhower. 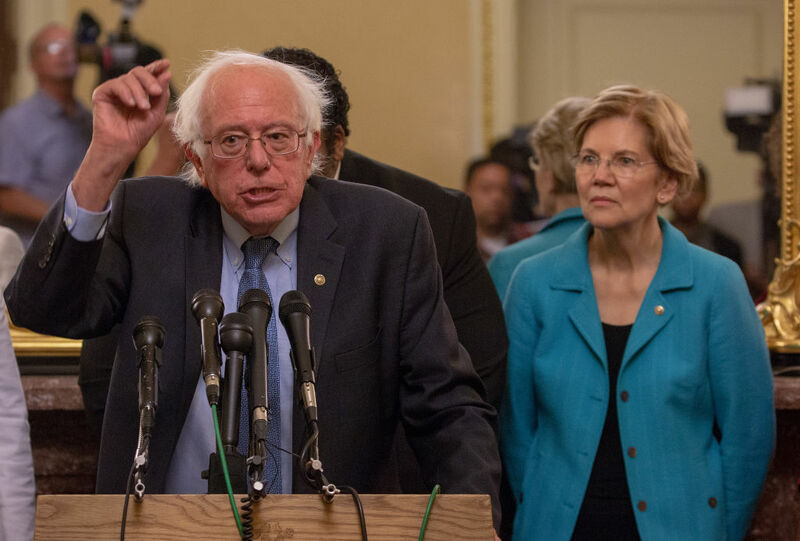 With the announcement of Warren’s exploratory committee and Sanders’s likely entry into the Democratic race, it will be important for voters to carefully study the nuances of Warren and Sanders’s records and worldviews. While both are critics of the Democratic establishment, their long-held beliefs suggest they would prioritize different solutions, both in terms of the policies they would push and how they plan to achieve them. Warren is a brilliant legal scholar who changed party allegiances after studying the abusive practices of the financial industry. As a senator, she has been effective at promoting change, primarily through brilliant interrogations at hearings and effective advocacy within the halls of Congress. Tellingly, she sat out the 2016 Democratic primary, choosing to offer compelling but private policy advice to the Clinton campaign. That is a very different approach than that of Bernie Sanders, who defied the conventional wisdom in 2016 to run for president and became one of America’s most influential politicians thanks to thousands of volunteers and small donors. In a span of just a few short years, he has made his social-democratic policies mainstream. More Democrats now say they prefer socialism than say they prefer capitalism. As soon as the next president takes office, they will likely face intense pressure from powerful interests, especially big business. The choice between Warren and Sanders may very well determine if that president confronts those interests with careful reasoning and principled advocacy or the force of a mass movement. Zaid Jilani is a journalist currently doing a fellowship studying political and social polarization at UC Berkeley's Greater Good Science Center. Who Wants Bernie to Run?